As digitalization continues to move across the O&G sector, new sources and production capacity continues to come online. “Big Data” and real-time data are fundamentally transforming the how of Oil & Gas exploration & production – pushing more bi-directional transfer of information from well to HQ. With all of this data information, VSAT Broadband connectivity will continue to mirror its terrestrially-connected counterparts. 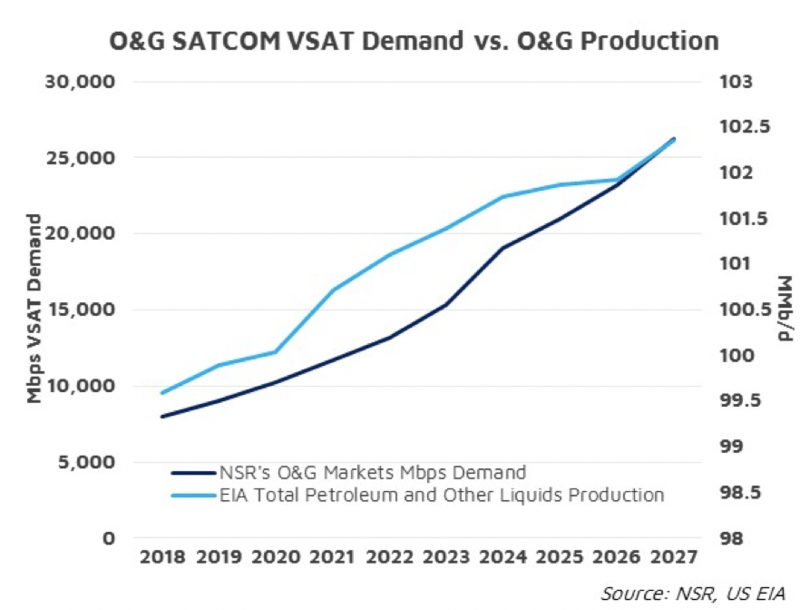 Combined with lower latency options that are only going to increase in total capacity, the O&G SATCOM Market will continue to demand more and more connectivity in more and more places. Using Data from NSR’s Energy Market’s via Satellite, 7th Edition, the Oil & Gas Market will consume 7.9 Gbps of FSS, GEO-HTS, and Non-GEO HTS capacity in 2018. Most of this will come from FSS capacity, as the industry continues the migration towards GEO-HTS. Driven by the exploration & production side of the O&G market, both onshore and offshore – applications that support the operation of these sites, connecting the crew running them, and increasingly, connecting the equipment at the site itself are driving these ever-increasing levels of satellite capacity demand. Processes that were largely analog such as well production reporting, or DVDs for crew entertainment are not only moving to digital – but moving towards centralized servers ashore or requiring some form of data synchronization between shore and wellsite servers. By 2027, data demand will grow to over 26 Gbps, driven by those same applications we are seeing today. Just as in consumer markets, we are seeing a revolutionary change in bandwidth consumption habits – industrial segments such as Oil & Gas sites will similarly be transformed by applications running today. More processes will become digitalized and increase reporting requirements, crews will stream more content to personal devices, and industrial applications for high fidelity video (such as we see with home video-based monitoring) will only become more commonplace. While the need for more ‘real-time’, i.e. latency sensitive, applications will increase – there are many applications where the size of the pipe continues to be the bigger factor, rather than the latency of the pipe itself. Looking beyond raw Mbps demand for Broadband SATCOM connectivity, the U.S. Energy Information Agency projects in its Energy Outlook 2017 that Petroleum and Other Liquids Production will rise from 99.5 MMb/d in 2018 to slightly less than 102.4 MMb/d by 2027- a net increase of 2.75 MMb/d over that time period. Compare that production with SATCOM Demand? We see that increased production falls in-line with increased demand for satellite connectivity. Traditional locations are ‘running out’, which means more greenfield and brownfield exploration & production is going to be required, especially on the exploration side of the market. Technology is pushing more data that is required for each barrel extracted. Moreover, emerging locations will start at the same rate of digitalization as their terrestrially-connected counterparts, as the delta between ‘terrestrial and ‘satellite’ throughputs and quality of experience is diminishing. Technology is also continuing to expand, with new fields having the latest and greatest sensors, databases, and operational processes – and older fields quickly being retrofitted to take advantage of these improved processes. By 2026, the expected experience between ‘terrestrial’ and ‘non-terrestrial’ will continue to demand more and more data in these remote locations. Even accounting for the clear majority of petroleum production occurring at terrestrially-connected locations, the expectation of connectivity is pushing higher levels of satcom connectivity across the sector. With the growth of satellite connected sites projected to be minimal from 2017 – 2027, Service Providers and Satellite Operators should look to invest in capacity and infrastructure that enables the most bits per site.